Students using Campus Safety’s shuttle service to travel to Detroit Metropolitan Airport may have noticed a rate increase. The one-way cost per student this academic year is $75 or $35 with a group. Students can sign up to be transported at nearly any time, so long as they do so a week in advance. Shuttles are not available on major holidays, during campus events or on weekends between 6 a.m. and 6 p.m.
Last year, students could pay $20 for a one-way trip, by signing up for one of Campus Safety’s scheduled shuttle times. Campus Safety Director Ken Snyder said his department terminated the scheduled shuttle this academic year because few students opted for it — of 42 students brought back from 2017-2018’s winter break, only one chose a scheduled shuttle time. Most students opted for the higher rate so they could choose their own departure time. Up until 2016, Campus Safety would transport students to the pick-up sites of Michigan Flyer, a business that buses riders from Ann Arbor and Lansing to Detroit Metro Airport. According to Snyder, Campus Safety’s one-way rate to Michigan Flyer, up to $40, coupled with Michigan Flyer’s own rate, resulted in a total price similar to what Campus Safety charges now. Sophomore Ashley Iglesias said Campus Safety’s current pricing is a bit too much. She said a round-trip shuttle cost can feel like buying an extra plane ticket to her hometown of Glendale, California. Much of the money she earned working on campus went toward the ticket and the transport. Snyder said the cost is worthwhile. Students can choose their own travel time and be transported by trained drivers. Instead of paying up front or in advance, the shuttle cost is charged to a student’s account. If students do not want to pay the price for a shuttle, Snyder recommends reaching out to Metro Detroit-area students. Some drive their peers to the airport for free. Another option is alternative transportation. One-way Greyhound Lines bus trips from Albion to Detroit start at $26. A one-way train ride from Albion to Detroit starts at $20. The catch is both busses and trains have set scheduled departures, so trips must be scheduled well in advance to get such low rates. Campus Safety does not offer trips to the smaller Kalamazoo/Battle Creek International Airport, located just 45 miles off campus. 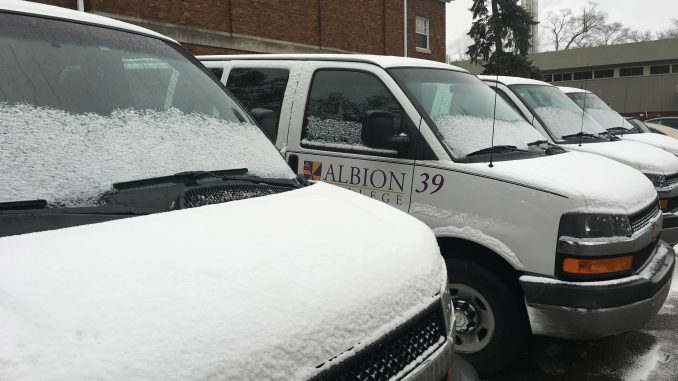 As the number of out-of-state students, who are more likely to use the shuttle service, has grown, the department has reached capacity for its transport capabilities. Snyder also said that Campus Safety still loses money despite the rate change. Paying for employment, gas and vehicle rentals adds up. Campus Safety made 20 trips, bringing 55 students back to campus from winter break, the most it ever transported for a break. Of those students, only five paid $75 for an individual trip back. The rest were able to group up, paying the one-way $35 rate. Iglesias was one of the five $75 individuals. Last spring, she paid $75 to travel home for summer break, too. As a lacrosse player, she often stays later than most on campus, making it difficult to find a group to get a lower rate. Nevertheless, she appreciates the service. She’s found Campus Safety to be accommodating, kind and on-time for pick-up.